Everything about the Hyatt Place in Moab was great, from the pool to the breakfast to the service and friendliness of the staff. We enjoyed every minute of our 3 night stay there! Located too far from town and a staff that was poorly trained and rude. My wife was accosted by a clerk who demanded to see her room key when she was pouring a morning cup of coffee - like she was some hobo who had snuck into the place. Won’t stay there again. This Hyatt is exceptional. It's brand new, has very modern decoration, everything works, breakfast choices are extensive and staff are great. Don't know why anyone would stay anywhere else in Moab. it’s been about 5 years since I’ve stayed at a Hyatt Place and they’ve stepped up those game. This was a great hotel. Breakfast each morning was great. We enjoyed our time here! No complaints - very good service, food, and comfort! New Beautiful Hotel. Pool is very nice and the food in the kitchen for order was delicious. The breakfast was also delicious. Will always stay here when I travel to Moab. Nice designed, perfect view of the mountains ⛰ pool aria is awesome. Lions Park is within 2 miles (3 km) of Hyatt Place Moab while other popular attractions such as Rotary Park are within 3 miles (5 km). This 3-star hotel has 126 rooms and welcomes guests with a restaurant, an outdoor pool, and a 24-hour fitness center. Enjoy a leisurely bite to eat at the onsite restaurant, or have a drink at the bar/lounge. You can sip a beverage at the coffee shop/café. Start each morning with buffet breakfast, available for a fee from 6 AM to 10 AM. Guests can expect to find 43-inch a flat-screen TV with satellite channels. Tempur-Pedic beds sport premium bedding and down comforters, and the bathroom offers a hair dryer and designer toiletries. Other standard amenities include a refrigerator, a coffee maker, and free local calls. At Hyatt Place Moab, guests enjoy features like an outdoor pool, a 24-hour fitness center, and free WiFi in public areas. You can take advantage of free parking, along with a shuttle from the hotel to the airport (available 24 hours) for USD 20 per person. The front desk is staffed 24/7 to help with securing valuables, tours or tickets, and luggage storage. Additional amenities include a conference center, a 24-hour business center, and a seasonal outdoor pool. 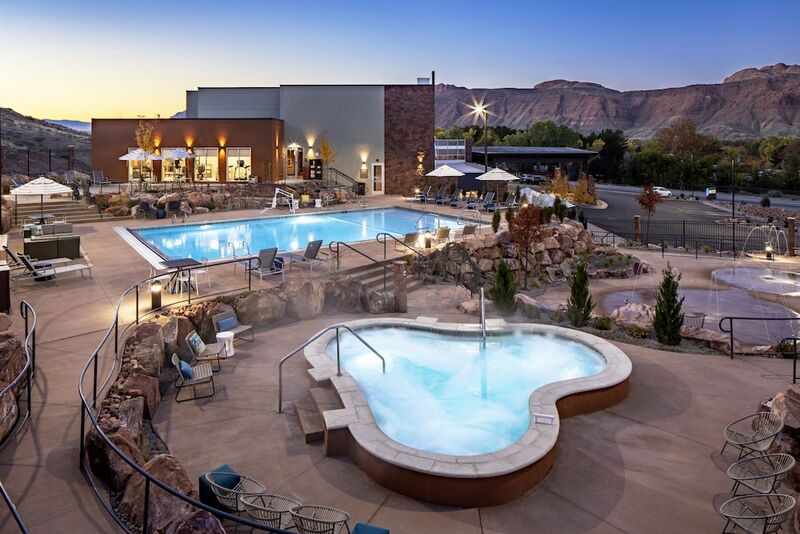 Recreation features at Hyatt Place Moab include an outdoor pool and a 24-hour fitness center. The preferred airport is Moab, UT (CNY-Canyonlands Field): 19-min drive, 17.3 mi/27.9 km. The front desk is open 24 hours a day. For convenient departures, you can take advantage of the airport drop-off service (fees apply). Driving? This property offers free parking. After-hours check-in is not available at this property. Guests arriving outside front desk hours will need to wait until the next morning to check in. It is Hyatt's practice to enter any occupied guestroom at a minimum of once within a 24-hour period, even if a guest has requested privacy. Appropriate efforts are made to provide advance notice to the registered guest before entering an occupied guestroom.